NOISE: that would be the down side of sound. 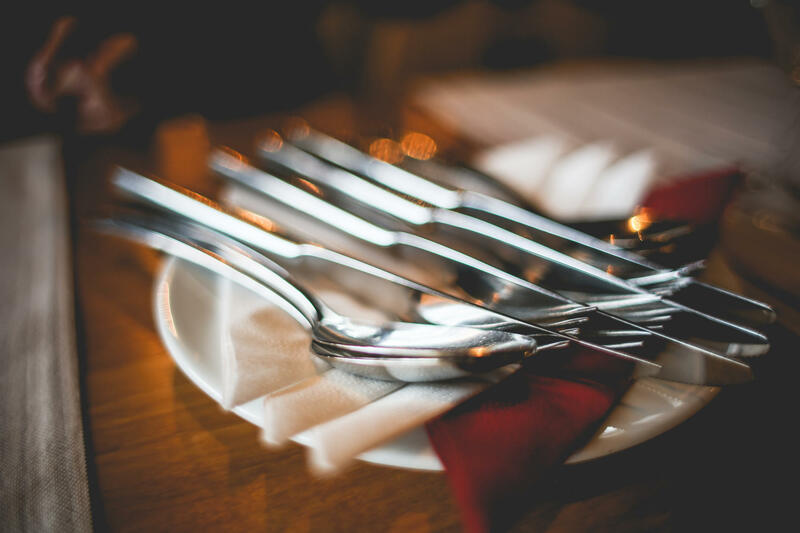 Restaurants generate an inordinate amount of it….kitchen pots, dishwashers, bus tubs, clinking silverware, conversation, ringing phones, music, etc. In restaurants some sound is sound and some sound is noise and all of it is part of the acoustics of your restaurant. Acoustics is one of the invisible design elements that many restaurateurs ignore until they start getting complaints. STOP IT! Ignoring the acoustics of your restaurant until after you open is more expensive than addressing acoustics during the design process. In both dollars and lost customers. And as we, your customers, continue to age, we get more and more sensitive to noise. This year’s Zagat survey puts noise as the #2 complaint of restaurant goers (service was #1….and we’ve already talked about that). I’ve gotta agree. Hubby and I ate at a local restaurant a couple of weeks ago, one that we really enjoy most of the time, and nearly had to walk out. It was early and the restaurant wasn’t very crowded. So the large table of women at the front of the restaurant, who were apparently having a very good time, were painfully audible. Their shrill laughter bounced off the brick walls, ricocheted off the very high plaster ceiling, and reverberated with deafening clarity in our eardrums. The server kept apologizing, or at least that’s what it looked like she was doing since we couldn’t actually hear her. Once the dining room filled with more diners, the sound level evened out and, while this table of women didn’t quiet, the ambient sound of the room backfilled the sound of their laughter. Those in the world of acoustics call this masking. So, would you have known that what was needed was more sound to ease our pain? Guessing probably not. One restaurateur had the good sense to realize that what he knows is food and service, and he hired the experts to deal with noise BEFORE he opened his restaurant. During the design process John Paluska, of Berkeley’s Comal, hired engineers to create a system to dampen, move and adjust the sound of his restaurant. While this is a very sophisticated system and may not be necessary in your restaurant, you do still need to address your room’s acoustics. That is if you want me, or anyone like me, to eat there more than once. Back to our local eatery, as a designer I would recommend the owner hire an acoustical engineer to work with a designer (yes, me) to create something to ease the acoustical pain. If even that is too big an order, then at the very least hire a designer who has done restaurant work (again, me) to at the very least put some bandaids on the pain. We can add acoustical panels and sound absorbing materials to dampen and separate some of the sound. And do it soon….because you have some of the most delicious green chile stew I’ve ever had! When you open your next restaurant, be a hero. Hire whoever you need to get your acoustics right…this may be an invisible design element, but your customers care about their auditory comfort. They may not compliment you on your acoustical brilliance, but they’ll certainly complain if you ignore their ears. And we all hate whiny customers, right? ps….you can totally ignore my blatant self promotion, but please don’t ignore my message. You are an amazing restaurateur, hire someone with amazing acoustical chops to deal with the sound of your restaurant.